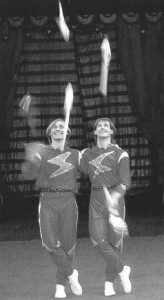 The Two Miagkostoupovs were the Russian juggling team of Anatoli Miagkostoupov and Victor Pilipovich. They graduated from the Circus School in Kiev (Ukraine) in the mid-1980′s and performed with the Moscow Circus. Their act included synchronized 6 club fountains, five club back crosses, various steals of five clubs, and passing 10 clubs. This is one of the clubs used by the Two Miagkostoupovs in the 1980′s. It was made in 1984 and consists of a tapered wooden dowel and high pressure styrofoam body covered with reflective decorations. Donated by Anatoli Miagkostoupov.